I've been in Colorado Springs all week attending the Colorado Antiquarian Bookseller Seminar. I arrived last Sunday and have absolutely relished the cooler weather. The temperature for me has been so perfect with slight cool breezes. We've even had two rainstorms. Eat your heart out Palm Desert (home)! I dread going back home to the inferno. This conference has been absolutely the most amazing experience. It is a complete immersion into the world of books, not just bookselling. We have studied the history of printing. We even learned to fold and cut books, just as they were done in Guttenberg's time. We've covered bibliographic terms and collation formulas. (What the hell is a collation formula you say? Here's an example of one: 2°: π 1 a-b² A-2L² 2M1; 74 leaves. This is NOT a calculus formula but it is a formula which tells how a book was assembled when it was printed using a hand-press). Sunday evening's Keynote Speech was perhaps one of the most electrifying and amazing moments in my life (I do mean this). The speaker was Mark Dimunation who is Chief of the Rare Book and Special Collections Division of Library of Congress. It was such a revelation and a beautiful one at that. 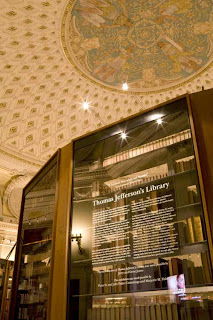 What I learned that night was that Thomas Jefferson was responsible for the Library of Congress' existence. He was a voracious book collector, in addition to all of his other genius qualities. Thomas Jefferson and his book passion burned quite bright, literally: in a strange series of fires that cursed his book collections. “The nucleus of the Library of Congress was forged in fire,” Mr. Dimunation said in his retelling of the Jefferson library story, a story that begins with a 1770 fire that burned Jefferson’s family home in Shadwell, Va., and consumed most of his first library consisting of some 200 volumes, including his law books and 40 books he had inherited from his father. In the years after this fire, Jefferson went on a passionate global book buying quest. By 1789, when he returned home after living in Paris for several years, he had already doubled the size of the original collection which had been destroyed. Fire again played a significant role in Jefferson's collection when in 1814 a fire destroyed the entire collection of the Library of Congress, an institution Jefferson was responsible for originating. The fire which burned at the US Capitol was set by the British. Jefferson offered to sell his entire collection of books, which now comprised 6,487 volumes, to reestablish the nation's Library. Following a rancorous bi-partisan debate, Congress approved the purchase. (alas, some things will not ever change). He read and collected, in their original languages, Greek and Latin classics, books of contemporary 18th-century European philosophers and thinkers who influenced his thoughts on the rights of man. 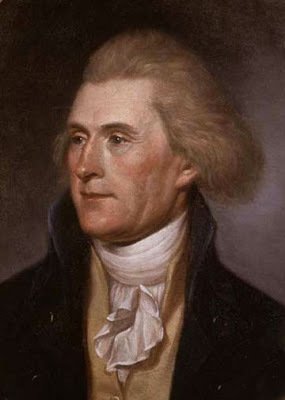 Jefferson also bought and used books on politics, law and history, books on art, architecture and music, books and pamphlets on all branches of science. (from Library of Congress website, see reference at the bottom of this posting). In a bizarre twist of fate fire once again became a part of Jefferson's history, when a fire at the US Capitol in 1851 burned almost two-thirds of the original Jefferson collection that was purchased by the government. Mr. Dimunation and his staff have been on a quest to replace all of the original collection volumes that were burned. They have narrowed the missing volumes to just under 200. Which is quite remarkable. When he finished his keynote speech, our speaker received a fervent round of applause. I wanted to scream "Encore! Bravo! Encore!" it was just such a remarkable story about books and the Library Congress and Thomas Jefferson. That fine institution will be my first stop when next I am in DC. Okay, so what does this have to do with William Blake, the poet and the artist, you say? Mark Dimunation, the keynote speaker, had attended our seminar here in Colorado Springs at the request of one of his staff, Dan DeSimone, who also is one of the faculty members for Colorado Antiquarian Bookseller Seminar. Mr. DeSimone is Curator of the Library of Congress' Rosenwald Collection. He also has been one of my favorite of the faculty members, perhaps because he has given some optional lectures at lunchtime which have been quite fascinating and fun and illuminating for me. The two that he's done so far featured topics from the Rosenwald Collection. 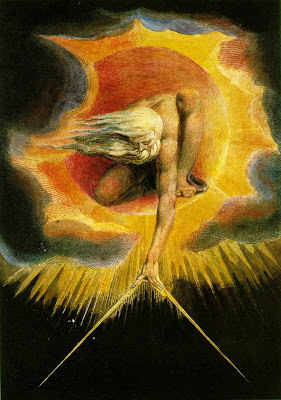 Which brings me to William Blake. The Rosenwald Collection includes a number of books published by Blake. I cannot wait to read more about this amazing human. 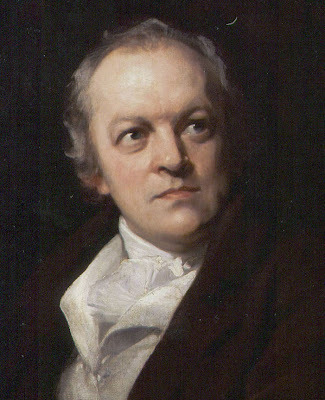 First of all Blake was considered a lunatic in his time and wasn't really appreciated by his peers. There is a Caravaggio-esque quality to his story that has me hooked (see my previous post on my Caravaggio fascination http://markgsmusings.blogspot.com/2009/07/lost-painting-fantastic-book-about.html). This is Blake's Ancient of Days. The "Ancient of Days is described in Chapter 7 of the Book of Daniel, which is in the Rosenwald Collection. I haven't had much time to learn much more, although I spent a couple of hours reading last night about Blake. And that's how William Blake, cool temperatures, Colorado Springs, Thomas Jefferson and the Library of Congress all were in common this week. The quotes from Mr. Dimunation above as well as the photo of the Library of Congress are from the following link at the Library of Congress website. It is an interesting story so read more about it at: http://www.loc.gov/loc/lcib/0806/jefferson.html. About The Rosenwald Collection: "The Lessing J. Rosenwald Collection stands out among the distinguished resources of the Rare Book and Special Collections Division. 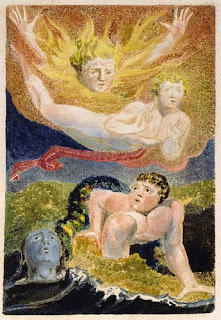 Taking the illustrated book as its central theme and containing books from the last six centuries and manuscripts from the three preceding, the collection's greatest strengths are in the fifteenth century woodcut books, early sixteenth-century illustrated books, William Blake, and twentieth-century livres des peintres. Within this grand design the late Mr. Rosenwald sought books produced by the earliest printers and outstanding presses of later periods, and books on the following subjects: science, calligraphy, botany, and chess. The catalog describing the collection published in 1978 contains 2,653 entries, many for books represented by more than one copy." 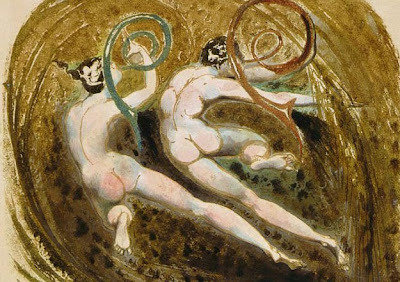 To see more of Blake's amazing artwork visit: http://www.blakearchive.org/blake/. Have a wonderful cool day. I will!